Offering you a complete choice of products which include hydraulic oil, hydraulic oil 68, industrial hydraulic oil, hydraulic oil 100 and torgs hydraulic oil 68. A hydraulic fluid or hydraulic liquid is the medium by which power is transferred in hydraulic machinery. Commonhydraulic fluids are based on mineral oil or water. Hydraulic Oil 68 No. is a high-grade ep - hydraulic oilseries based upon selected, solvent-refined base oils having a naturally high viscosity index. 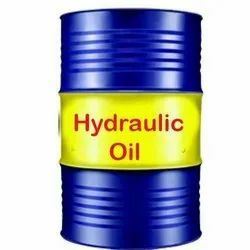 hydraulic oil may be used for both heavy-duty hydraulic equipment and light-duty gearboxes and bearings. Common hydraulic fluids are based on mineral oil or water. Examples of equipment that might use hydraulic fluids are excavators and backhoes, hydraulic brakes, power steering systems, transmissions, garbage trucks, aircraft flight control systems, lifts, and industrial machinery. Hydraulic Oil ISO 100 is good quality, top achievement hydraulic oil developed to accommodated the appeal for environmentally acceptable hydraulic fluids. This product is based on synthetic, readily biodegradable esters.